Here are some interesting pic's I found for the Playbus/Playdays title seq. 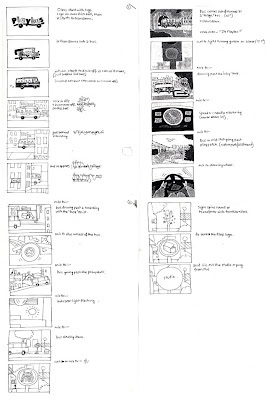 One of the initial thumbnail boards and a quick breakdown note for the Music. You can see it here. Morning. 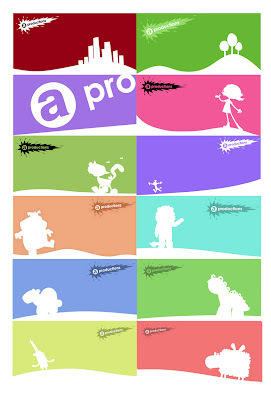 New headers added for our web site (the last 5 on the picture). Will they appear for you? Good Monday Morning. 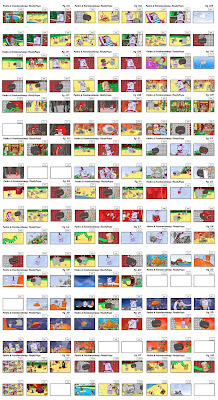 Here is a picture of lots of Pictures from a little corparate video we just finished. It was quite fun. I've removed all the brand names so you cant see what it was for. Shhh, secrets. Just because it's Friday! Here is Van Halen holding a goat... who is dressed as a monster! Morning! 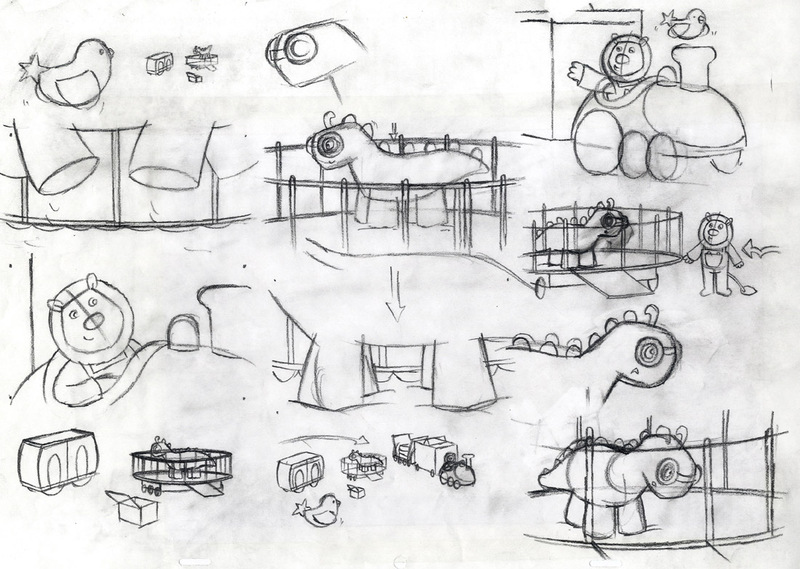 Here is another Mr Phil sketch thinking thoughts for the Story Train storyboard. 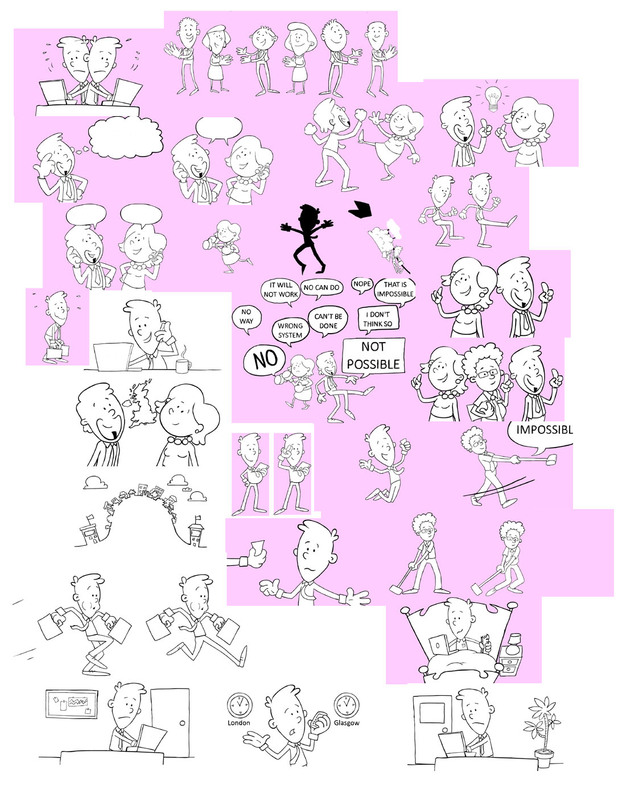 I will post up a finished story board page soon so you can see how lovely and neat the drawings end up looking like. Morning. So here is a pic of Musty and all his parts. You can see on the right how many levels he was made up of. His mouths at the bottom were just the forward happy mouths set. He had a happy, sad and neutral set for each head position. If you note he couldnt be flipped or left arm used for right arm due to his bandage and colours. Mr Tom did a lovely job sorting out the initial mechanics of this series. He did a lot of the library work. Here is a Magical Green Screen Log. Mr Paul wanted to make sure that between him and Mr Ray and myself we know where we are with the green screen sections for StoryTrain. 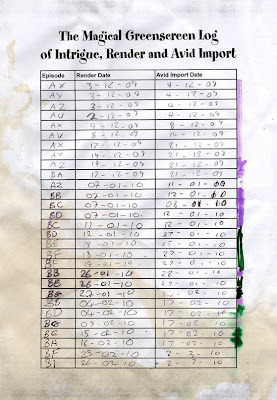 Mr Paul and Mr Ray do the compositing and rendering and put into Avid, then the rubbish coloured pen scribbles on the chart are when I have edited the sound with the green screen on Avid. Oh and look! It's tea stained! I would like to take this opportunity to make it be known that Mr Paul was in no way responsible for spilling the tea. 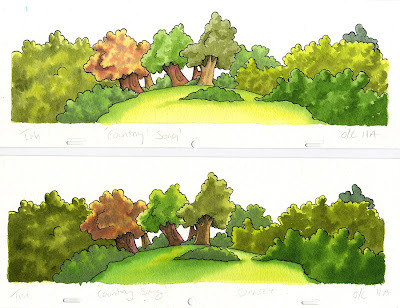 Here is a background overlay for Town and Country Mouse for OUP. Two different versions for the same location but with different lighting, one day and one sunset. I couldn't find the sky backgrounds to show you the full effect of the different lighting. 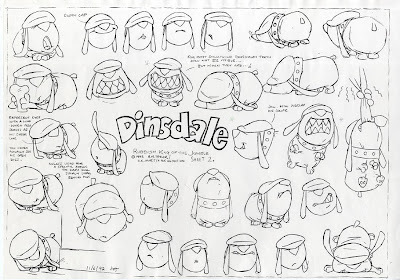 Here is one of the model sheets for Dinsdale from Rubbish King of the Jumble. He is a funny fellow. 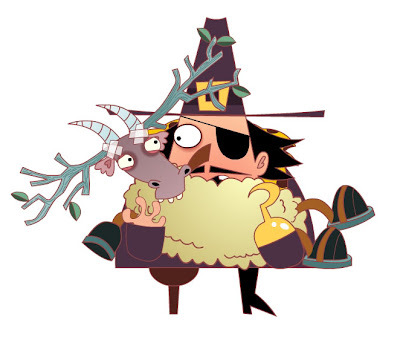 This is the colour BG board for the 11 minute pilot we did for Pedro and Frankensheep. This was to visually check the basic Backgrounds were ok and were geographically correct to the camera. Other props and furniture were added afterwards. 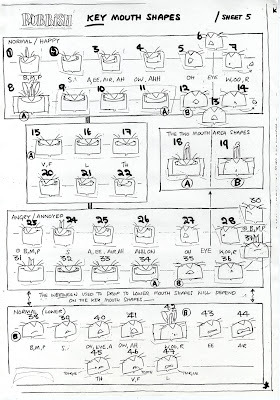 Here is another props page from two episodes of Franks Cat. Miss Emma wanted today's theme to be EVIILLLL. Those were her words, not mine. 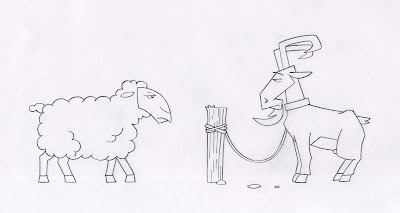 Here is a ram and a sheep. Good Monday to you all. 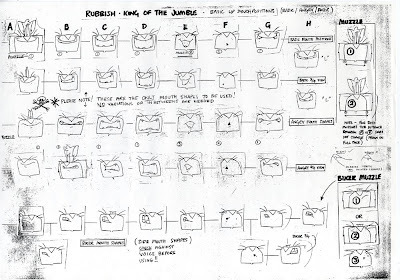 Here are two mouth shape sheets for Rubbish. You can see one of the sheets is 1 of 5 and the other is a Biker Mouth sheet for when Rubbish was being 'hard' so he spoke out of the side of his mouth. 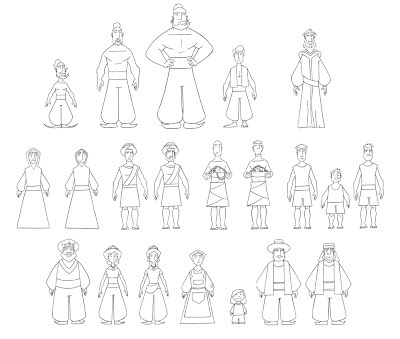 A lot of detail here but you need to give the animators as much as possible so the character remains consistent. 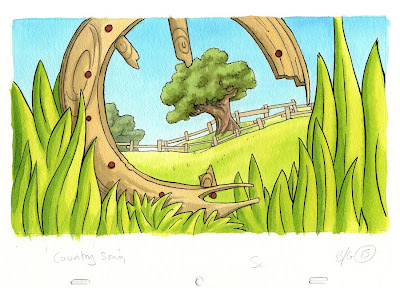 Here is another Mr Curtis sketch for some BG's. This time it's for 'The Big Foot Burglar' episode of Franks Cat. 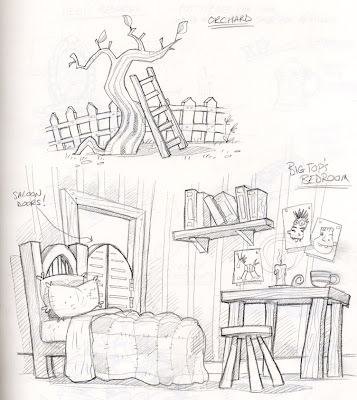 If you look at a previous post under the Franks Cat tab you will see the finished version of Bigtop's Bedroom. 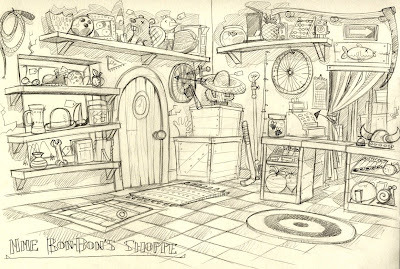 Here is an interior sketch for Madame BonBons shop from Franks Cat by Mr Curtis. 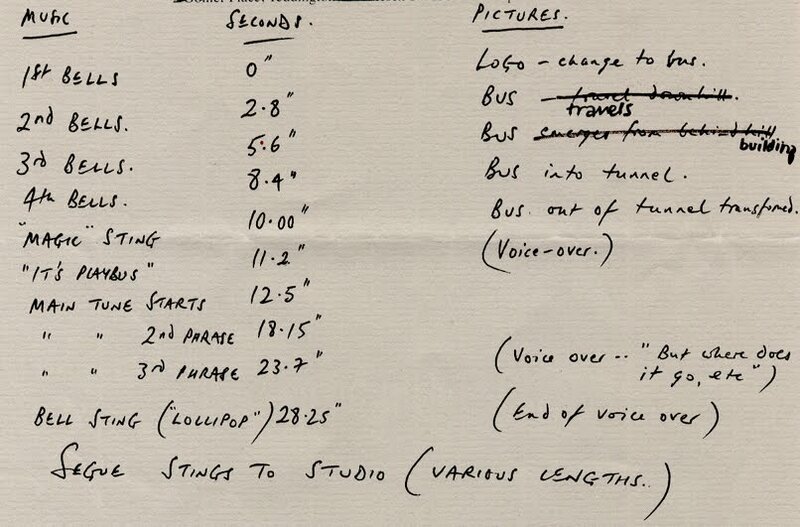 He would do all the initial sketches for new props, characters or locations for each episode from the script. The section inside BonBons shop was eventually cut and just a quick scene outside her shop where she pushes the last hay bale out of a window ended up being used. But I like the drawing. 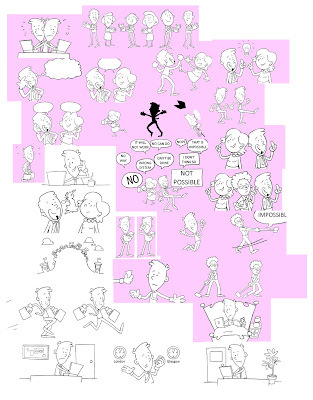 Here is a load of pictures grouped together. 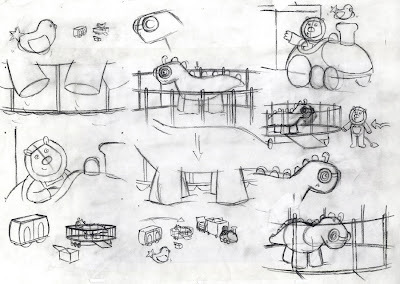 The pictures with numbers at the top right were initial sketches drawn my Miss Leah. Then once the client gives us feedback to what they want we then get the other pictures for a story board. This shows a bit of character development. 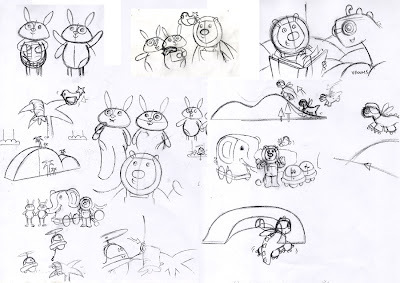 Here are some more sketches from Mr Phil who is doing the storyboard for StoryTrain. 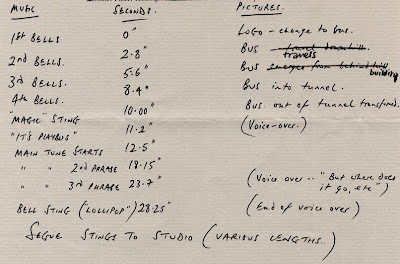 This is from his thinky pad which he uses to work out shots roughly. You can see a lot of Hip and Hop here, they are the rabbits. Here is a BG from an OUP project called Town and Country Mouse. Thought it looked nice and summery for this mornings nice sunshine. Even though I am actually sitting here at my desk with a big coat round my legs and lap as it is freezing! 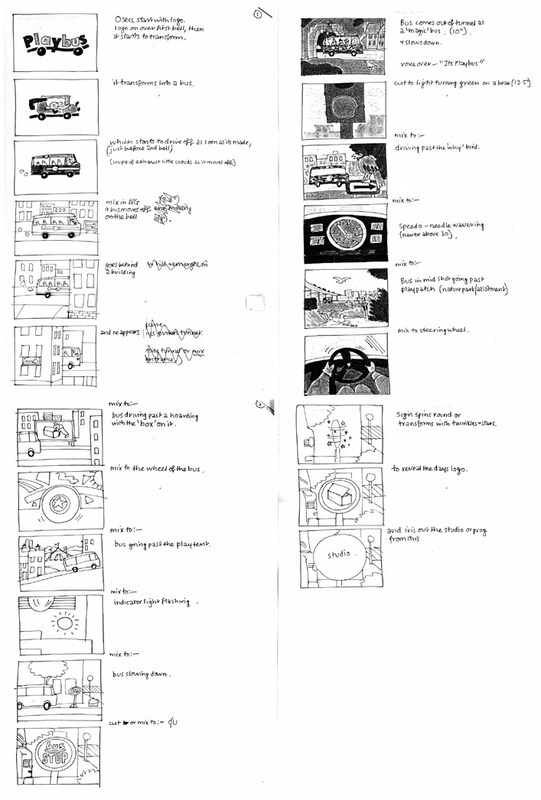 I thought I would post up another storyboard. 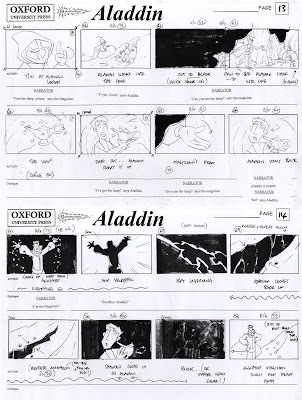 This one is from the OUP short Aladdin. I posted the characters a few days ago. Here is a picture of Mr Wolf. 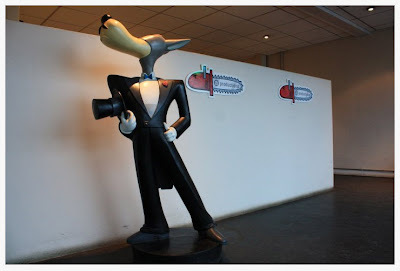 He stands by the entrance to our studio. 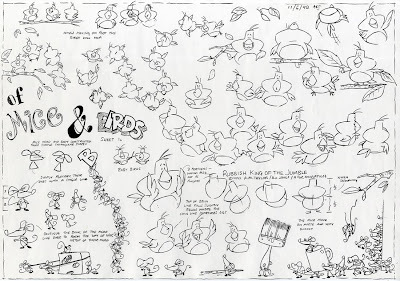 Here is a model sheet for the mice and birds from the Rubbish King of the Jumble series. 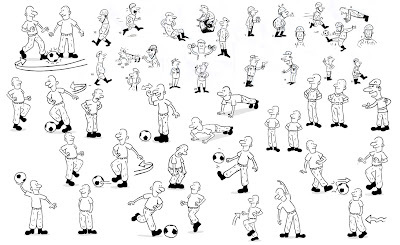 This picture shows the group of characters we did for a short for Oxford University Press. It was Aladdin, in case you didn't realise. They were all animated in 2D. They are all to scale too, I like the little girl. It would have been better to show you them all in colour but it would have been coloured in Animo and I'm not sure where it is at the moment. It's hiding. Here is a turn around for Musty who is built in Flash. 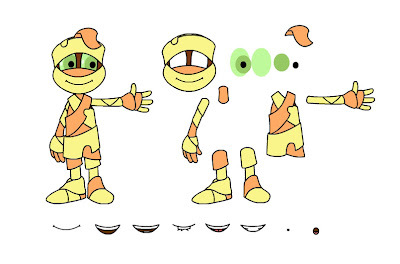 He is from the series Dusty and Musty we did for HIT which was initially intended to be 2D traditional but we animated it in Flash in the end as the characters were so complicated. It meant we could get away with a certain amount of reuse whilst still approaching it with 2D traditional practices.